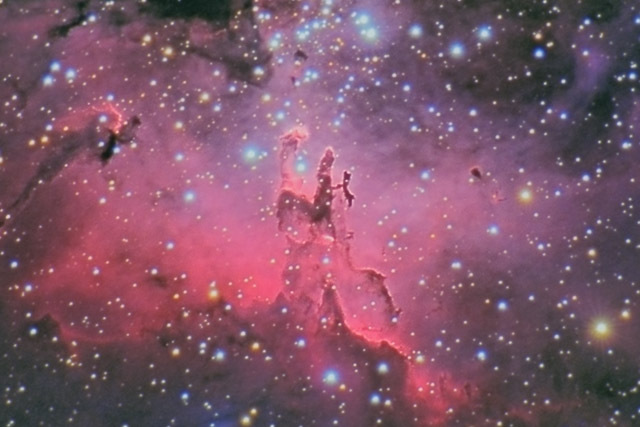 The Pillars of Creation is a star forming region located at the center of M16, the Eagle Nebula. The pillars consist of cool hydrogen gas and dust that are forming new stars. Ultraviolet light from hot newborn stars is illuminating the region, as well as causing gaseous erosion that leaves globules of dense gas. 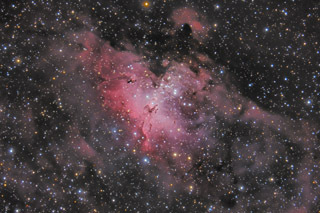 These globules are where protostars are condensing to become newborn stars. The Pillars and M16 are located about 6500 light years from us. The largest pillar is about 4 light years tall - about the same as the distance from our Sun to its nearest stellar neighbor, Proxima Centauri (4.2 light years from the Sun). The Pillars of Creation were the subject of one the Hubble Space Telescope's most famous images. Released shortly after the December 1993 mission to repair Hubble's spherical abberation, the Pillars image established with certainty that Hubble's optical problems had been clearly resolved (no pun intended). While the Hubble Space Telescope enjoys diffraction limited resolution of about 1/10 of an arc second, the image shown here is constrained by my telescope's much smaller size (approximately 1/12th the diameter of HST) as well as seeing effects from the Earth's atmosphere. Nevertheless, in this image stars separated by as little as 4 arc seconds are clearly resolved into individual stars. More significantly, my equipment costs a couple billion dollars less than the Hubble Space Telescope! In this image, North is to the upper left. This image is cropped to 27% of the original full frame. Notes This was a difficult image to capture well, as the image shown here is a very tight crop. As such, any imperfection in capture or processing becomes rather obvious. While the image isn't perfect, I think I was able to display some very good details in this beautiful object.